Abbreviations: EC, European Commission; EM, electromagnetic; EMF, electromagnetic fields; EP, European Parliament; IARC, International Agency for Research on Cancer; ICNIRP, International Commission for Non-Ionizing Radiation Protection; RF, radiofrequencies; WHO, World Health Organization. “A critical review of studies on the biological and health effects of RF/ EMF found that, out of 1,056 articles published in peer-reviewed journals, 44 percent reported negative results (no effect), with 93 percent being funded either by private bodies or by non-specified sources. 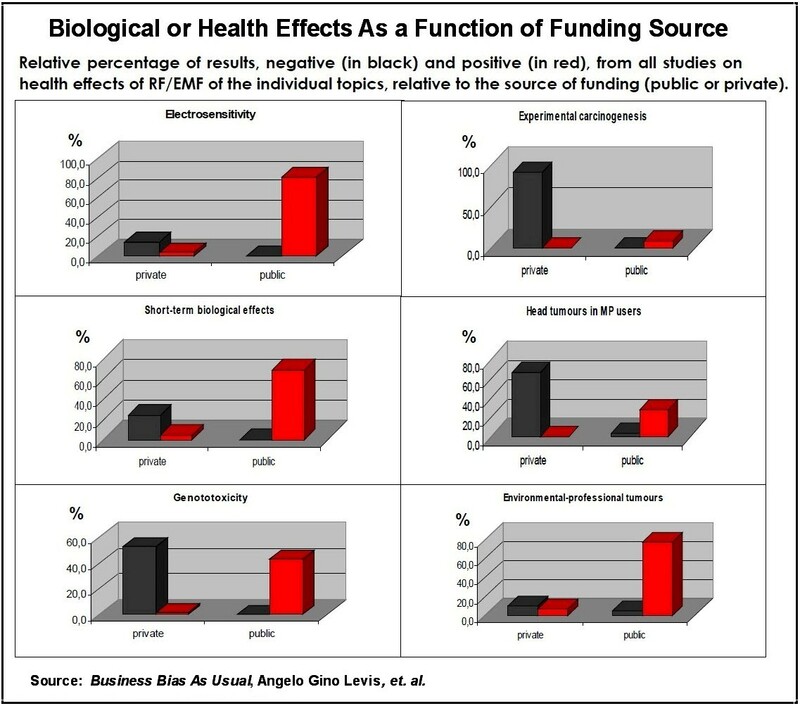 Instead, 56 percent of the articles reviewed reported some kind of biological effect or harm to health, with 95 percent funded by public bodies.” Refer to the figure below. Unpublished study prepared by Levis, Gennaro, and Garbisa entitled, “Business Bias As Usual: The Case of Electromagnetic Pollution.” The essence of this unpublished study was later incorporated and published as Chapter 11 in a book titled, Social Costs Today: Institutional Analyses of the Present Crises, edited by Ramazzotti, Frigato, and Elsner, Published by Routledge, 2012. Refer to the following link for additional information: http://www.routledge.com/books/details/9780415508469/. This entry was posted in Smart Grid, Smart Meters, and RF Emissions and tagged Bias, EMF, Health Effects, RF Emissions. Bookmark the permalink.